Ezreal Answers Questions About Future Champions and More! Q: Are there any other support champs in the works? Q: Will there be another Yordle Jungler in the next year? Q: Can we expect a new female AD ranged carry anytime soon? Can we get a new mage that is ice based? We have Anivia but I just don't feel it with her. When I say ice mage I think of Crystal Maiden, Lich, or AA from DOTA rather than Anivia. I guess more than anything I'd like a freeze and the slow debuff. Note: Seems like we'll get two heroes, one female ranged ad carry and an ice mage! 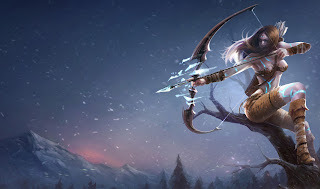 Some of you might wonder if maybe it's the same hero, but we do have Ashe already, so that wouldn't make much sense. Am I not...icy enough for you? A: Well, our primary focuses in doing champion updates are as follows: make the character more fun, fix the core problems, and don't remove what make the character fun in the first place. So yes we redesign characters to make them more fun. Q: Will Riot ever have a system where we can purchase the announcers voice to be something else? possibly popular champions? Q: What do you think about mana/energy stealing items? Possibly an active that uses the opponents mana to cast your own spell? Q: When are the Heimerdinger updates coming out? Q: More Zaun Champions and Lissandra the ice dervish? Note: Lissandra may turn out to be the ice mage that Ezreal mentioned is being released in 2013! What do you guys think about these tidbits? Anything particular that you're excited about? Comment below! I WANT LISSANDRA THE ICE DERVISH SO BAD. I care relatively little about everything else, but it all sounds exciting, as is usual for announcements from Riot. You never know, just because Riot hasn't explicity said that there wont' be one doesn't mean they won't make one! Also, I think we have plenty of assassins already haha. Hi N! Welcome to the site and thanks for commenting! I hope really hope they come out with Lissandra too, even her name sounds cool! Very interesting article, got me all excited with the "A: 2013 will be a good year for you"
at least if they kept it the same as good ol' AM , farm 20 minutes carry hard how? 5 sec cd blink bro.